Pug Freestyle and letting your Pug dance! Pug freestyle is starting to catch on. You’ve heard of dancing with the stars – how about dancing with the dogs? Yes, more and more owners are taking their Pugs out on the dance floor. While it sounds crazy many owners say that this is one of their favorite activities to do with their Pug. Pug freestyle is actually a combination of dancing and dog training. The dance team, of course, is the Pug and you! The event is complete with music and the Pug and owner are out on the dance floor as the owner guides the Pug through a choreographed routine to the music. Freestyle has been around for at least 20 years and grew out of people’s love for music, dance and their dogs. It teaches your Pug obedience so you might think of it as dog training set to music. While it's not for every owner, we encourage you to check it out because Pug Freestyle can be a lot of fun. It is quite an event and costumes are part of the fun. It’s very possible to see a formal routine with a Pug dressed in a tuxedo or a square dance type them where the Pug is in his western best. It’s all meant to be a lot of fun but there are also prizes that can be given out. Are Pugs natural dancers? Pugs are cute, lovable and can be quite entertaining but, truthfully, they may need a little extra help than other breeds when it comes to dancing. The best advice is to be aware of what your dog does best and work it into the dance routine. We do not enter our dog into Pug Freestyle events but, if we did, we know what we would do. Our Pug stands up on his back legs quite well. He’s been known to walk across the room and do a complete turn to get a little treat so these might be “moves” that would show up in a dance routine for him. As we said, we don’t participate in this particular activity and it came as quite a surprise that it even existed but, apparently, it’s becoming more popular. A dog wardrobe would fit in nicely here and it isn’t hard to come up with some entertaining possibilities for Pug freestyle outfits. Although this is not as energetic as the agility competition we talked about elsewhere, it’s still a good idea to check with your veterinarian on your dancing plans for your Pug. He can give you some valuable advice on what not to do with your dog. Your Pug’s health is the most important thing here. Since Pugs are susceptible to respiratory problems and possible hip and joint conditions you want to be especially sensitive to these areas. While we’re on the subject of health you also don’t want to check out your own ability to undertake dance training with your Pug. Although not a strenuous activity it could be more physically demanding than you might think so check with your doctor to make sure you’re physically ready to become your Pug’s Dance Master. There are actually two types of Freestyle: Musical Freestyle and Freestyle Heeling. Basically, the difference is in the activity of your dog. In Freestyle Heeling the trainer does most of the dancing and the dog follows by “heeling”. It can actually appear, when done correctly, like your Pug is invisibly attached to you while he follows you around the dance floor. In Musical Freestyle your dog will actually “move” to the music while performing a variety of tricks and obedience maneuvers. Exhibition Freestyle actually takes it up a notch and allows some tricks and maneuvers that might not be allowed in a formal competition. This is where costumes come into full play. There are various groups that run these events and the rules of competition vary by group. Generally, the scoring is done on both a technical scale (how well your Pug follows your commands) to how creative the routine is. The movements of the routine and the actions of both dog and owner should follow the music or you’ll see a reflection of that in the scoring. Freestyle dates back to the late 1980’s and many people point to Canada as the actual starting place. It should be noted, however, that many groups came into being almost simultaneously. There are groups throughout the United States, Canada, the United Kingdom, the Netherlands and even Japan. Some of the larger organizations are: the World Canine Freestyle Organization, the Canine Freestyle Federation, The Musical Dog Sport Association in North America, Canine Freestyle GB and the Pawfect K9 Freestyle Club in Japan. The main thing is to have fun with your Pug. 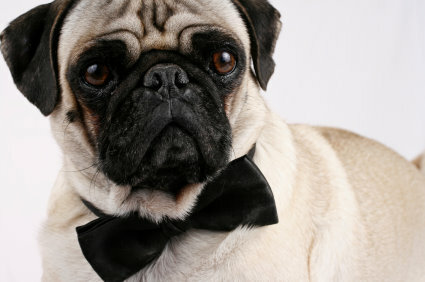 If dancing is not your thing then explore the other Pug activities besides Pug Freestyle we talk about on this website. There are games your Pug will love playing and, if you want to be more serious, obedience competition might be something to consider. If nothing else you’ll end up with a better behaved dog and learn a lot about training your Pug.